You remember learning in grade school about the importance of observing, measuring and experimenting in order to form an educated opinion or solution right? Well thankfully the Mallard Testing Lab engineers certainly do and they regularly use this process while solving client pallet flow product challenges. 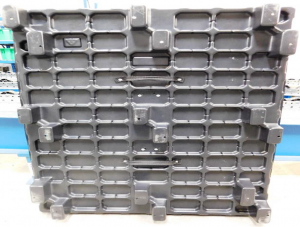 One of the most often asked challenges that we test involves pallet flow solutions for pallets of varying weights, and while that may seem pretty simple, when you’re talking gravity and weight you really have to consider all options. The plastic pallet test we recently completed proves out this theory. The Challenge: Consistent flow for lightweight plastic pod pallets with product weights varying from 75-265 lbs. in a single pallet flow lane configuration. The pallets tested are new but the bottom “pods”, or feet, are staggered as opposed to horizontal boards typical in a wooden pallet. With each pallet having 18 individual and staggered pods, our challenge was to ensure consistent contact with the pallet flow rollers to produce a smooth, regular flow from load to discharge end. 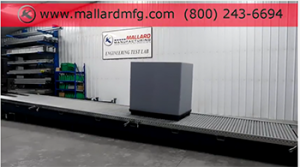 First-off the engineers selected full-roller pallet flow which is a go-to pallet flow solution for pallets of varying weights and irregular footed pallets. In this case, the full-roller pallet flow worked almost a little too well initially. The first test on a 7/16” pitch proved a little too fast for the heavier weighted pallet so the lane pitch was changed to a more mild 3/8” per foot pitch. 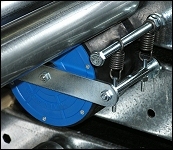 In addition, an indirect mount speed controller was added to further slow the rollers as the heavier pallet advanced. Importantly, the pitch change was still enough to also move the lighter-weight pallet, and since the indirect mount style of the speed controller doesn’t make direct contact with the pallet it didn’t inhibit the flow of the lighter-weight pallet. We had a viable solution. One last test to confirm that we had the best possible solution… The system was tested with the rollers at 3” centers vs the 2” centers of the first test. The 3” spread between the rollers proved too sparse for the good consistent pod/roller contact that we were seeking; therefore, the 2” center was the correct solution. While we didn’t experience any hang-ups with this design, plugging (gently pushing back front pallet before extracting) would be all that would be needed to restart rear pallets. It always feels good to go back to a customer and tell them that we have a solution to their challenge… and we’re sure it’s gonna work! What challenge are you experiencing in your inventory or product rotation & fulfillment operations? Give us a call and let’s get those testing engineers working out a solution today.